In this animated series, a boy and his friends bond with strange creatures that emerge from the Earth's crust. Together, the kids and the creatures must fight evil forces that want to enslave the Bakugan. This series is a reboot of the original Bakugan series, which was a marketing tool built around a line of toys and games. Shun Shine: The AO want to evolve their Bakugan like Dan did with Drago but only Shun finds a way by tapping into the energy of the Mind Core Cell./Ronin Son: When Shun's cousin Masato Kazami claims Hydorous as his intellectual property the AO must battle to keep their friend by their side. The Throw Down: Lightning reveals his discovery of the Mind Core Cell but the AO arrive only to discover that Magnus has already beaten them to it./Brawl for It All: With both team's Bakugan knocked into a hibernation state by the Mind Core Cell only Dan and Magnus remain locked in a brawl for it all! A Real Steal: Dan embarks on a solo adventure to outdo Magnus's new team of Bakugan Brawlers and winds up having to be saved by them instead./Lightning Unleashed: Lightning uncovers the Mind Core Cell buried beneath the Earth and battles Stata the Hunter in an effort to protect its secret. Tripped Up: Dan and Wynton stumble on both a possible hidden location of the Mind Core Cell and Colonel Tripp who wants the energy source for himself./Power Tripp: After a falling out with Dan, Wynton is mind-controlled by Tripp who stages an attack to ignite a war between Brawlers and the Military. Framing Device: When confronted by China Riot Lia learns to evolve Pegatrix after realizing the true meaning behind her filming obsession./Bad Actors: Dan tries to lie about evolving Drago and gets exposed while the team face off against Duran Dane and his unhappy Bakugan Nillious. AO want to evolve their Bakugan like Dan did with Drago but only Shun finds a way by tapping into the energy of the Mind Core Cell. Then, Shun's cousin claims Hydorous as his intellectual property the AO must battle to keep their friend. AO meet Benton Dusk discovering that their quiet little corner of the world is about to become larger. Then, Benton Dusk reveals AO have been identified as persons of interest by powerful corporations including Philomena Dusk's AAAnimus. Philomena Dusk from AAAnimus Corp. hires Magnus and gives him a control implant to bolster the power of his Bakugan to defeat Dan. Then, a cryptic call leads the AO in search of a missing Bakugan. After a Bakugan field errupts the town kids stampede to get their own Bakugan but when the field is contaminated Lia must save the day. Then, Dan and Wynton meet a boy who leads them into a maze where the boy's Bakugan has been enslaved. Wynton finds a new Bakugan who proves difficult to control but things get more complicated when Col. Tripp seizes control of Trox. Then, with "Dan" behaving strangely toward the AO Lightning sniffs out the truth, an impostor! The AO compete with The Exit, a rival Brawling team for ViewTube hits, leading to a "winner take all" brawl. Then, a promotor tries to get the AO to join an official league for Bakugan Battling. Dog Daze: Lightning discovers a new Bakugan, Artulean, leading to an unhealthy rivalry with Howlkor./In Focus: While Lia's newswoman mom does an expose on the AO Strata the Hunter tries to capture Hydorous. Frenemies: Two new Bakugan Brawlers, Shun and Magnus, try out for the AO./Strata's Fear: The AO solve the mystery of a kid's missing Bakugan and meet a Bakugan Hunter named Strata. Local Heroes: After the AO cause accidental destruction Dan's parents question whether the kids should be allowed to keep their Bakugan./Pegatrix: Lia disagrees with her new Bakugan Pegatrix on battle techniques but during a fierce fight Lia must rely on Pegatrix's battle savy. Burger Run: When the local Burger Joint is being threatened by a rogue Bakugan, Dan steps up to save the day and the burgers!/Monkey See, Monkey Don't: The AO stop neighborhood kids from copycat behavior (namely, using their Bakugan for frivolous reasons). Origin of Species, Part 1: Dan meets his partner Bakugan Drago for the first time and we learn about the incident that happened on Earth twelve years ago./Origin of Species, Part 2: Dan and friends win the Bakugan Battle, firmly establishing the Awesome Ones as our heroes and Bakugan Brawlers. 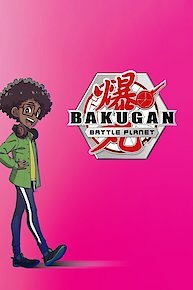 Bakugan: Battle Planet is currently available to watch free on Cartoon Network and stream on Cartoon Network. You can also stream, download, buy, rent Bakugan: Battle Planet on demand at Amazon, Sling, Google Play, iTunes online.